Ahoy, matey! Thar be a board game about pirates plunderin’ treasure and the merchants who dare t’ sail the deadly seas alongside ‘em! In Black Fleet, you play as pirate, merchant, and the navy – all on your turn. The ultimate goal is to earn enough gold to buy up an entire series of five Development cards laid out before you at the start of the game. Each Development card, when purchased and flipped over, holds a bonus to assist in your pursuit of dominance on the high seas. Your merchants are trying to take goods safely from one port to another, trading the value in for gold. Your pirate is trying to intercept other merchants to steal their goods and burying it for, you guessed it, gold. And the navy is on the hunt for pirates, and you’ll attempt to direct the two law-enforcing vessels in the direction of your opponents. A board game like this would seem a natural fit for dice. Something to roll for movement of the different ships. 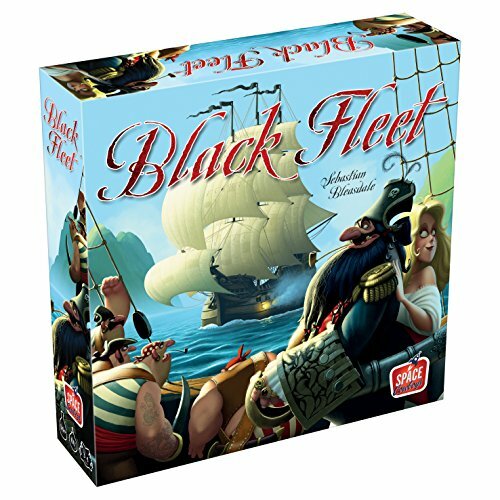 Instead, Black Fleet makes use of cards, drawn and played on your turn, that define how much movement your merchant, pirate, and one of the two navy ships can complete. Since you can have multiple cards in your hand, it does give you some choice each turn, but playing a card for movement is just never, ever, ever as satisfying as watching dice bouncing around a table. Black Fleet has all the makings of a game I should love. It has pirates, simple combat, and ways to screw over your friends. What it’s missing, though, is the fun. It just isn’t that fun. You’re playing scalawags and swashbuckling merchants, right? These are men who brawl and drink and sing and tell great stories of their conquests. Sounds like a blast. And none of that is here. All of the Pirates of the Caribbean sequels. All things come together in one turn your merchant delivers high-value goods, your pirate robs your opponent just before they’ve reached port, and the navy sinks your wife’s brigand. The art on the cards if colorful and fun, tricking you into believing the game itself will be colorful and fun. The ships are nice plastic models and it’s definitely a treat to place your goods in the slots on your ship. And the gold coins… so nice to even touch. Fantastic coins. Some of the best you’ll find in a game. There’s very little to the rules and this is one that can be taught quickly. Drinking game idea: Take a swig each time your pirates plunder a merchant. Then sing a pirate song whenever you bury your ill-gotten booty. The joy of plucking a good from your friend’s merchant ship and setting it in your pirate ship’s hold. Drawing cards for movement is not as cool as rolling a few custom dice. None. Piracy is wrong and you should feel bad for even thinking about it. Great components are a big part of what makes a game enjoyable for you. You want something light and easy to master. Questions about Black Fleet? Ask in the comments. Played Black Fleet and have your own opinion? Tell us! We may feature you in the Dog and Thimble Podcast.